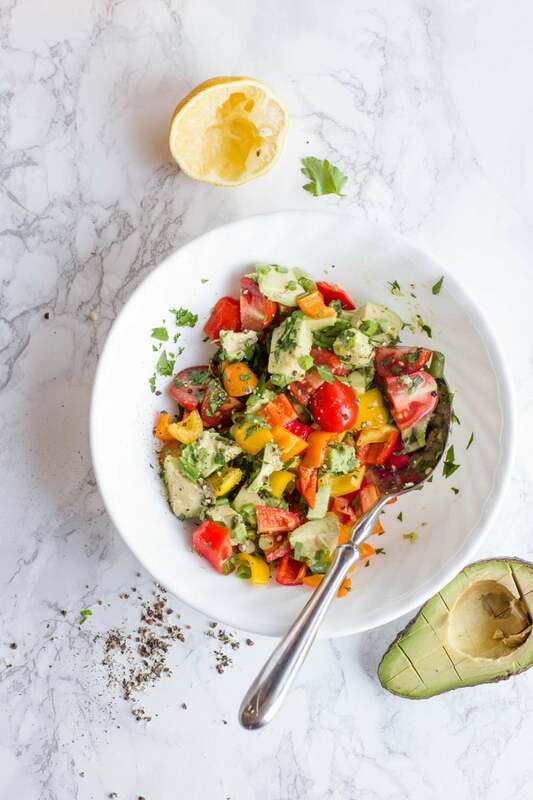 This Avocado Bell Pepper Salad is the perfect healthy lunch! 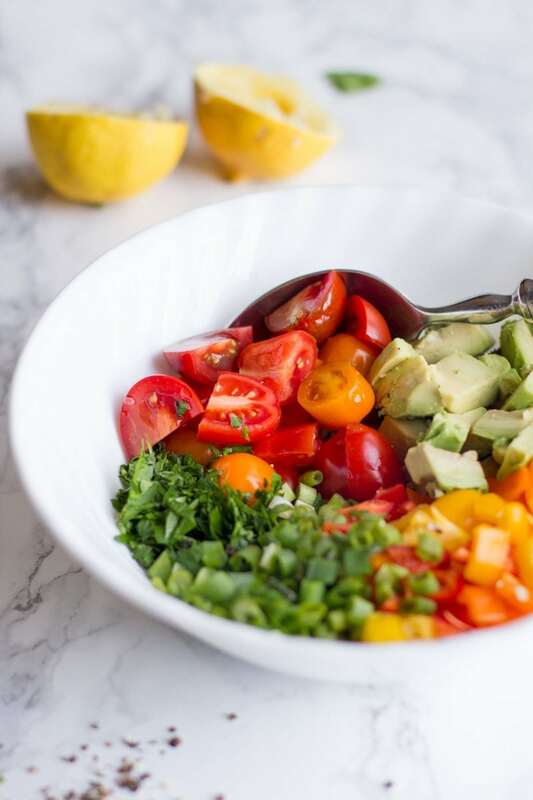 Colorful, flavorful, and filling, it’s a great way to kickstart a healthy diet. I’m hesitant to even post this recipe because it is so stupendously easy that it really isn’t a recipe. But then I remember that I eat this pretty much every other day for lunch, and I figure a salad that I eat that often should probably exist somewhere on my blog. We’ve officially reached the point in winter where I am so sick of potatoes and butternut squash and pumpkin and cauliflower and all the other good storage veggies that I can no longer resist the beautiful, bright, sparkly appeal of the out-of-season produce at my grocery store. 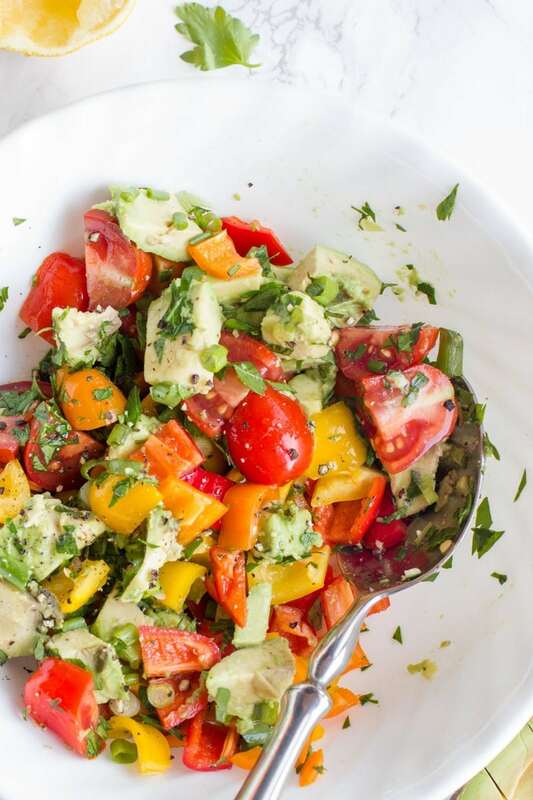 Is it wrong to lust after tomatoes and bell peppers and avocados and fresh herbs in January? Probably. But as you can see, that hasn’t stopped me from plopping them into my overflowing grocery cart. It doesn’t help that my toddler seems to be on an avocado-and-cheddar-bunny-only diet these days. Or that our stored potatoes have all sprouted already (what’s up with that?). Excuses. Excuses. Sometimes (okay, much of the time), I deal with a lot of self-imposed guilt over the food choices I make for myself and my family. I’ve been trying to cut myself some slack in the past few months with all areas of my life, but in particular food choices. We all do the best we can with what we have at the time. And right now, I’m just trying to get healthy, good-for-us food into my family’s bellies as painlessly as possible—and sometimes that means you gotta buy January tomatoes, ya heard? Speaking of January tomatoes, have you guys bought the little packages of the Wild Wonders tomatoes yet? You totally should. They somehow manage to make greenhouse tomatoes actually taste good even in the middle of winter. They’ll never be as good as a tomato picked fresh from your own garden in August, but they do the trick for satisfying a raging tomato craving in January. Anyone else get those kind of weird vegetable cravings? Just me? 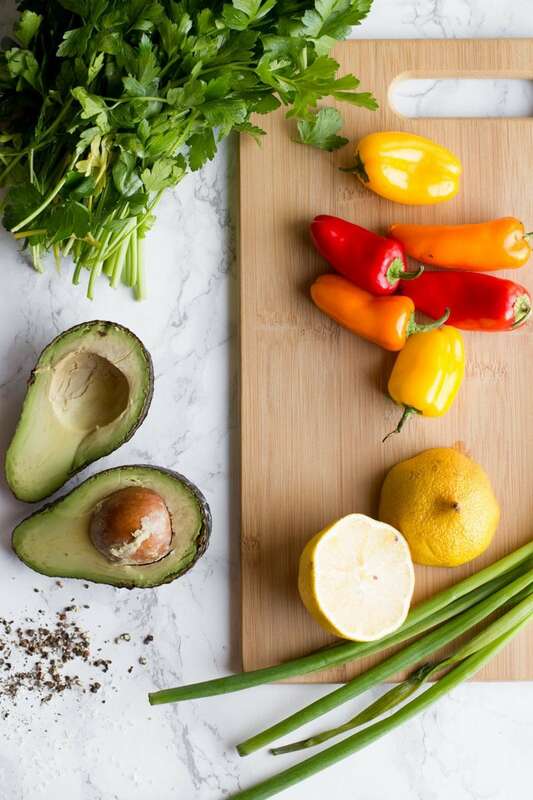 The avocado bell pepper salad down there in the recipe section is really just a suggestion for a jumping off point. It always has avocado, bell pepper, cherry tomatoes, and green onions when I make it. Sometimes I add feta, kalamata olives, and cucumbers and make it a Greek version. Sometimes I add black beans and cilantro and scoop it up with tortilla chips, salsa style. Sometimes I mix in tuna or chickpeas for a little extra dose of protein. It’s also amazing with pieces of day old bread torn up in it (like a panzanella!) and a runny egg thrown on top. You really can’t go wrong with whatever you want to add in (okay, maybe don’t throw in a brownie). It’s hard to mess this one up. I don’t do much in the way of a dressing or seasoning other than a good dose of fresh lemon juice and salt and pepper. Beautiful. Simple. Super healthy. This is the kind of food that I think everyone should be eating, but especially if you are new to this whole eating healthy thing. So easy. So tasty. So not even a little intimidating. Enjoy! Combine all ingredients. Enjoy immediately. Add in feta, kalamata olives, and cucumbers for a Greek version. Or add in some black beans and cilantro and serve it with tortilla chips. Toss in some canned tuna, chickpeas, or even put a runny egg on top for an added dose of protein. Make it your own! YUM. Fresh mozzarella is never a bad idea! This looks delicious and so refreshing! My husband would actually eat it too because it’s not like a typical salad. :) It almost reminds me of Israeli salad. I returned to Feedly after forgetting which blog I had opened awhile ago. I saw the picture and thought “Oh that looks like Back to Her Roots”. Your brand and visual “voice” is clear! Also, I was inspired and bought avocados, tomatoes, and cucumbers tonight to make something similar tomorrow. That makes me so incredibly happy to hear! Thank you, thank you, thank you! Inspired by your comment on Instagram the other day, I couldn’t resist and bought an egg poacher pan. But they are not so common here in France and I don’t know how to use them exactly (and mine came without a user manual). So, em…, although I’m feeling about as stupid as if someone my age was asking me how to fry eggs, I was wondering whether you could provide some basic instructions. Like: Up to what level should the water reach? Do you add the eggs only when the water is boiling or right from the beginning? How long do you cook the eggs? Thanks! Made this tonight to go with a pork tenderloin and simple pasta. Was delicious-a nice hint of summer in the winter. My 15 year old son liked it also. This looks delicious! Will definitely make it soon. Great Recipe Cassie. I like the fact you mention color. I love combining yellow, orange, red, and green peppers in one salad. My extra treat is adding whole black mustard seeds. 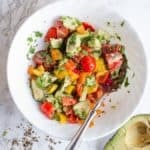 Healthy, Light, Colorful and Delicious!! !